September was something of a busy month. In August we bought a red and white setter puppy and it proceeded to create havoc in the household. We had been warned that puppies were life-changing – much like having a child – but no amount of forewarning quite prepared us. As I work from home, the brunt of Uther’s care falls upon me. Perhaps in a bid to prove to myself that I could work in adverse conditions – and that the tiresome routine of dog-care would not blunt my creativity – I set out to write as many short stories in September as I could. The novella, provisionally entitled “Beneath the Ancient Sun” will appear from Infinity Plus Books next year in a collection of four of my longer stories and novellas, Rites of Passage, and “P.O.O.C.H.” will appear in my collection Strange Visitors from NewCon Press next Easter. The remaining tales will be submitted to various magazines when I’ve knocked them into shape. And Uther, who is sitting on the floor gnawing at my chair as I type, sat through this burst of productivity with only the occasional interruption. 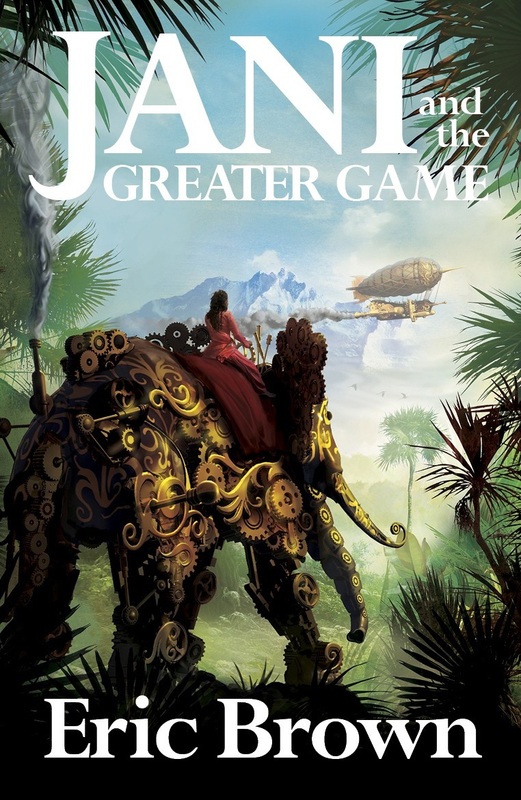 Here’s the cover of Jani and the Greater Game, the first volume of a steampunk series set in India in 1925. I think Dominic Harman’s done a fantastic job in capturing the feel and atmosphere of the novel. He did the cover of my last one, too (and many more of mine besides): The Serene Invasion, which just might be my all time favourite Harman. Jani… marks a bit of a departure for me. I’ve never written a steampunk novel before, and never written an adult novel from the point of view of a woman… and certainly not an Indian woman. Should be interesting.